You can use duct tape for almost anything. With the use of the versatile tape you can easily remove the lint off your clothing, reseal a bag of chips, repair a broken taillight or create a wallet. Teens use duct tape to construct outfits for prom every year and even NASA claims the material played an integral role in saving Apollo 13. But the one thing duct tape can’t fix is leaky air ducts. In 1998 researchers at the Lawrence Berkeley National Laboratory tested duct tape, as well as other forms of duct sealant, to determine which products could properly seal air leaks. Out of all 31 sealants tested by the researchers, duct tape was the only material that completely failed. The study found that duct tape always peeled off of duct work — sometimes in a matter of days — which allowed the junctions to open, resulting in air leaks. 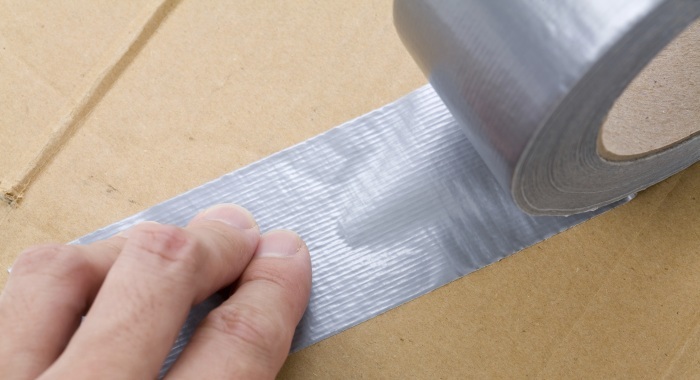 The researchers believe the adhesive is why duct tape fails as a sealant. When heating systems reach certain heats, the glue holding duct tape to the air ducts melts, causing the tape to fall off and leaving the ducts vulnerable to energy waste. Properly sealed air ducts could save $60 to $120 in energy costs each year, so it’s important to make sure they are working well. Instead of using duct tape to solve your duct problems, try mastic instead. It was proven long-lasting in the same 1998 Berkeley study. Mastic is a gooey substance that you can paint on your duct work. Once it hardens, it should seal any leaks and save you a few dollars on your energy bill. If it’s not for ducts why is it called duct tape? Duct tape’s history can be traced all the way back to World War II. It was then that the military was in search of a strong, waterproof tape to keep moisture out of ammunition cases. And Johnson & Johnson’s Permacel division delivered it. The company developed a new form of adhesive tape, made out of cotton duck cloth and a rubber-based adhesive. The combination formed a rubber, waterproof coating with a strong sticky backside — an adhesive tape known today as duct tape. However, the material wasn’t always called duct tape. The soldiers in WWII coined the term duck tape instead. Although it’s not entirely clear why they called it that, there are two theories of how the adhesive got its quacky name. The first is that the material floated and repelled water, like a duck. The other is that the tape was made using duck cloth material. Regardless of how it got the name, one thing is for certain: the name has evolved. Following the war, contractors began using duck tape to seal the joints in heating and air conditioning units and the name soon morphed into duct tape.